Fifth Annual Motor City Round at Grattan Raceway on August 16, 2018. 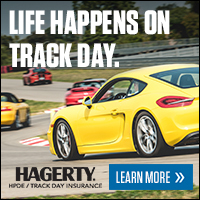 Join with other driving enthusiasts for a fun time at a great track! Warm up for the Woodward Dream Cruise! Included with registration is driver instruction (class room and in-car coaching), lunch, and an event t-shirt. The Motor City Roundup event is for everyone who wants to learn car handling skills and have fun driving their car fast in a safe and controlled manner. Any licensed driver is welcome, from experienced racers to drivers who’ve never been on a road racing course, and everyone in between. All makes and models are welcome, from vintage to late model, race setups to completely stock. Spectators and show cars are welcome, with free admission. The Motor City Roundup event is safely and professionally run by car enthusiasts that are experienced at managing open track events. Learn from experienced driving instructors who provide both classroom instruction and in-car coaching, all included in the registration cost. Drivers learn to drive their car safely at a level of performance with which they are comfortable. See www.motorcityroundup.com for more details. For lodging near the track, there is a block of rooms for a special rate at the AmericInn in Greenville, Michigan (ask for Motor City Roundup). For other lodging options, see https://goo.gl/dsOelu. The Motor City Roundup is brought to you by our sponsors. Please support them!